Even though I’ve had hundreds, maybe even thousands of bowls of pho, I can honestly say that the very first bowl of vegan pho that I ate was made by my own two hands. Well, my own two hands and an Instant Pot. 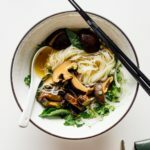 It’s no secret that I love pho but for some reason vegan pho has never really been on my radar. I’m kind of sad I didn’t discover it earlier because it’s really really good! What happened was this: Mike and I were chatting about what to make for dinner and we didn’t really have anything in mind. We were kind of thinking of making army stew or hot pot, both very good things. 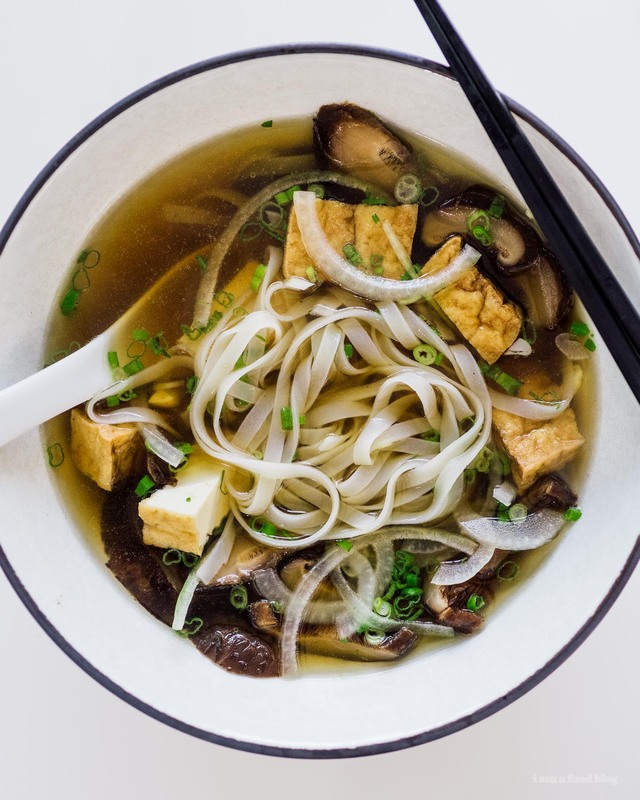 But then, as we were chatting, we came up with pho and since I was having a major tofu craving, vegan pho! I had no idea what to do, but Mike told me, “I’ve got this” so I just went with what he told me to do and it came out awesome. I guess Vietnamese people just know how to do pho right. 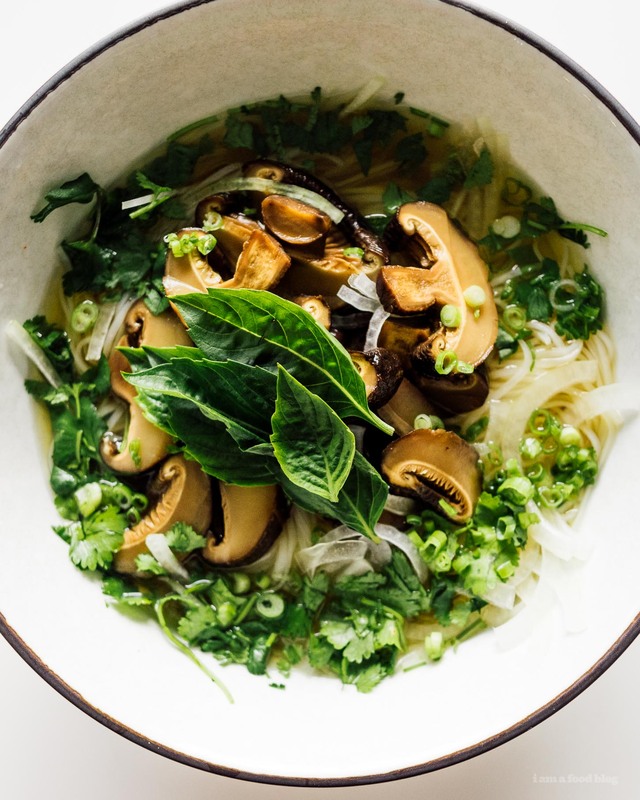 Vegan pho is incredibly easy. Easier than regular pho for sure. It also has the bonus of being a pantry recipe. If you have dried mushrooms and spices at home all you need to buy at the grocery store is a daikon, ginger, and an onion. Easy AF. 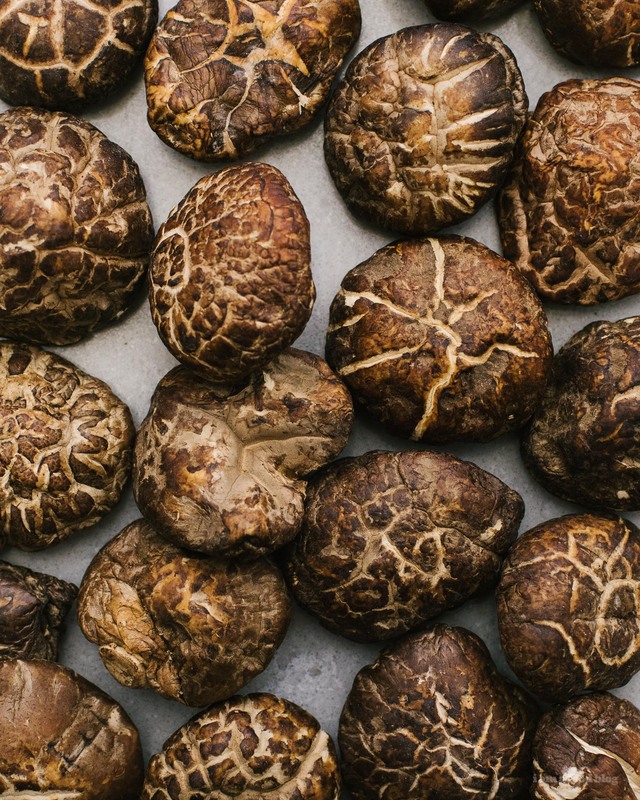 Dried shiitakes are what give this pho it’s umami-full backbone. Dried shiitakes really are a wonder food. They’re sold in all Asian grocery stores and I’ve even seen them in the Asian aisle at big chain grocery stores. They’re super tasty and essentially last forever because they’re dried. 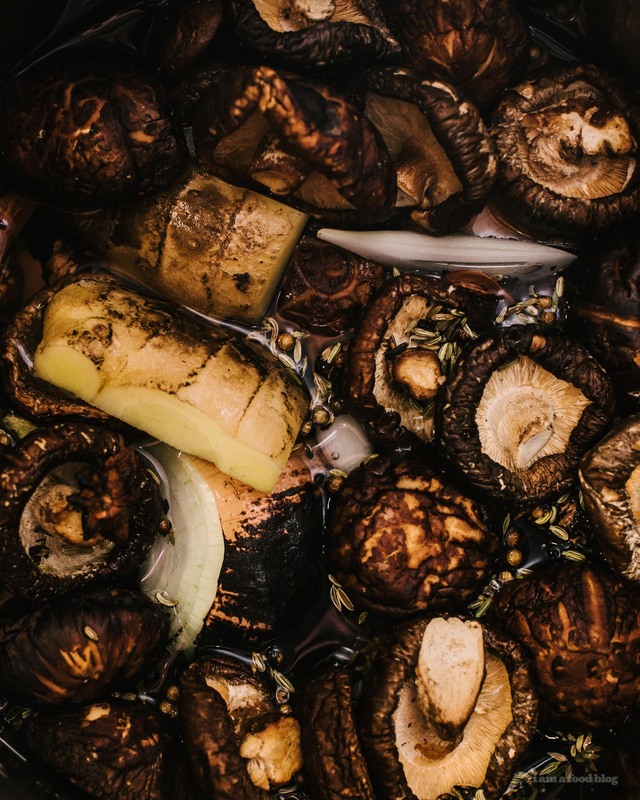 Once you have all your ingredients, it goes something like this: char your aromatics – that’s your onion, ginger and spices – then pop them into the Instant Pot with the daikon and mushrooms. Cook on high pressure for 45 minutes and boom, flavor city! From there you strain the stock, season it generously with salt and a touch of sugar, cook some noodles, cut up some tofu, and you’re done. So cozy, so light and healthy, and so so good. Bring a large pot of water to a boil – this is so the Instant Pot gets up to pressure faster. Feel free to skip this step if you’re not in a hurry. Start off by charring the aromatics. 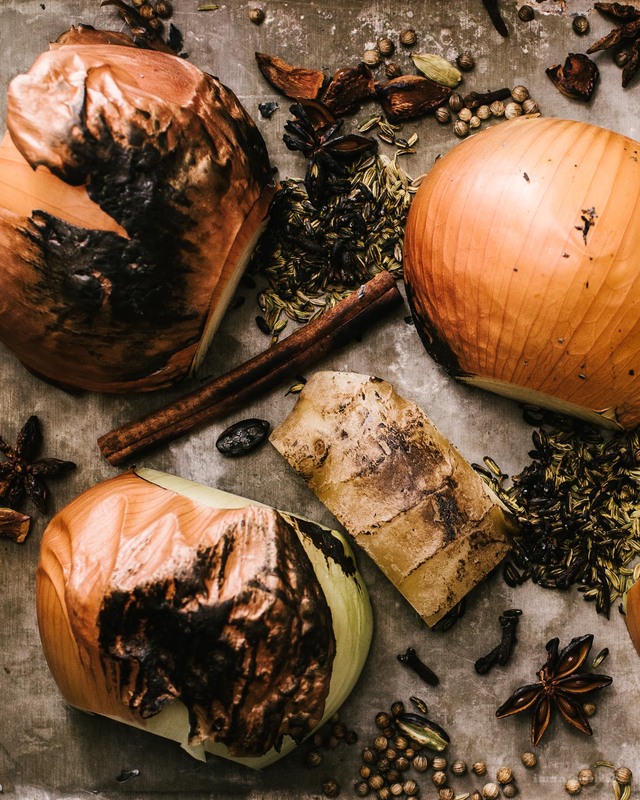 Place the onion, ginger, cinnamon stick, star anise, fennel seeds, coriander seeds, cardamom pods, and cloves on a rimmed baking sheet and blow torch until fragrant. 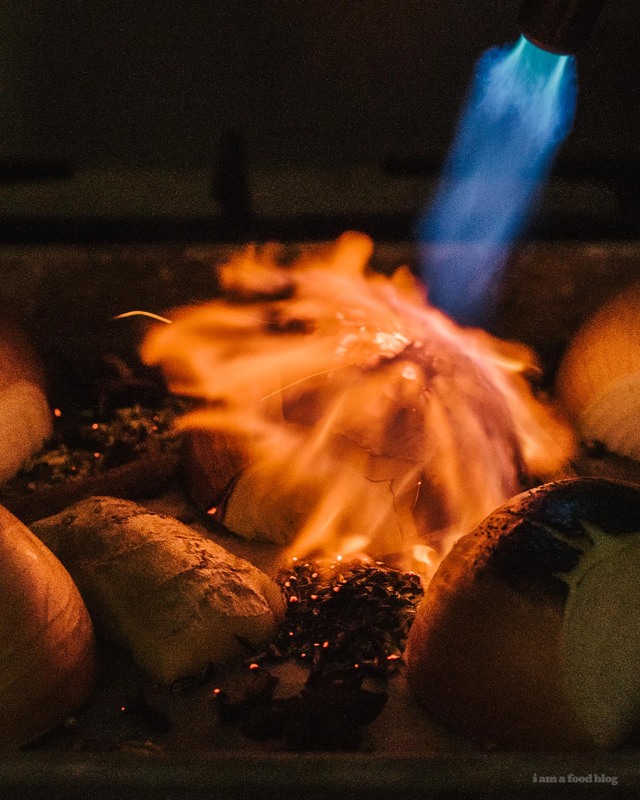 Alternately, char the onions and ginger on an outdoor grill, over a gas range, or in an oven broiler and toast the spices in a dry pan on low heat until they are aromatic, about 2-3 minutes. Tie the spices up in cheesecloth or large tea/spice bag for easy removal from your soup. 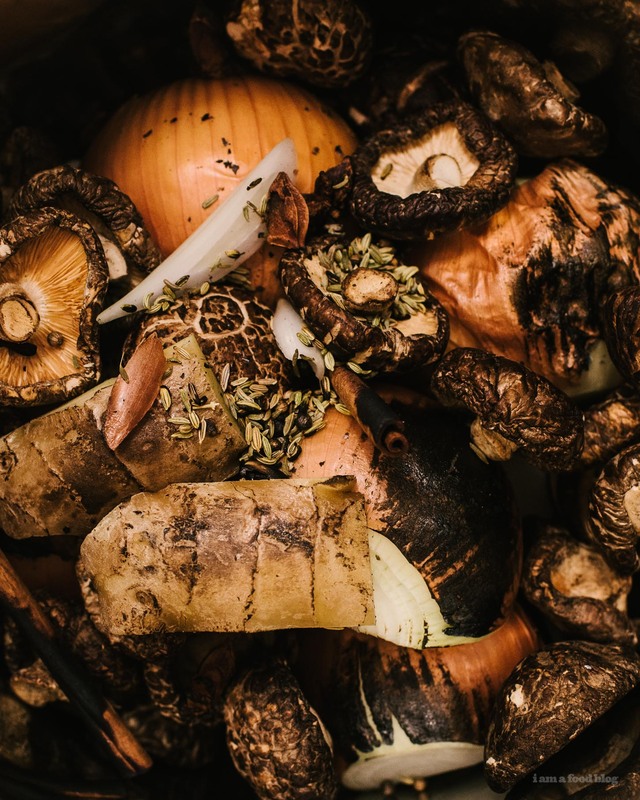 Add the spices to the Instant Pot along the shiitakes, ginger, and daikon. Add the hot water to the insert, up to the 4 quart line. Put the lid on, set the pressure to high for 45 minutes. Quick release when it’s done, then very carefully remove all of the mushrooms and aromatics. Season the pho broth with salt and sugar, being sure to season quite aggressively because the broth will have to flavor the noodles and toppings as well. For toppings, you can keep the mushrooms from the broth, just let them cool slightly, then trim the stems and slice. We also added two types of tofu: medium firm and fried, as well as some sautéed kind oyster mushrooms and wood ear mushrooms. To serve: Prepare the noodles according to the package, strain and divide evenly into large, deep bowls. Add a generous amount of mushrooms and tofu. Top with a generous amount of broth. Serve with limes, Thai basil, thinly sliced onions and cilantro and chilis. Have small dipping plates of sriracha and hoisin sauces for each person. Enjoy immediately!